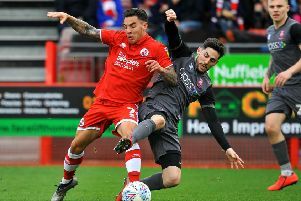 Crawley Town’s new centre forward Ollie Palmer is champing at the bit to get the Reds’ League Two campaign underway. Speaking after Crawley’s 1-1 friendly draw with Belgium’s KSV Roeselare, Palmer couldn’t wait to play competitive football. He said: “I can’t wait, none of us can wait. You can see we want to get our teeth stuck in, it’s what we’ve been working on for the last five weeks. “It’s been a tough summer, a tough pre-season. Crawley begin their league campaign with a trip to Gloucestershire as they come up against Cheltenham Town. The ex-Bradford man felt that the Robins will pose a stiff opening day test. He said: “It would be nice (to win) but it’s not the be all and end all.